I have raised a lot of rare heritage breed turkeys over the years, trying this breed and that breed.. Royal palms are my personally favorites.. However they are very hard to come by, no hatchery locally carries them and their out just over priced in a crazy way at the local bird sales.. I have been over the past few years raising more rabbit meat and less turkey.. I have been able to buy local farm raised turkeys at a good price point if I want to have one or two over the year. However 2018 was the odd year out. I did not raise any here on the farm, I didn’t like the prices of any raised locally (wow, the price went up) and I didn’t buy any from the store raised in a mass factory..
*I did buy a local Ontario turkey to have the thanksgiving dinner for Jason’s mom.. but that was a special event.. The thing is.. I missed having turkey in the house. It does have its own flavour that other meats so not. What I do not like is the cost of raising them.. No really.. Heritage turkeys are food pigs that do not give good meat/feed rates, heritage pullets are costly and that’s putting it nicely. I am meeting half way.. I am going to be buying turkey day old’s from the hatchery. I will be getting two types, both meat based.. not heritage based. Both White turkeys breeds. One is the traditional “white breasted” that would be what is raised in the mass production houses but will be raised my way. One will be the “mini Classic” they say? they have bred down the traditional white breasted bird to about half the size but keeping the fine flavour, the outstanding growth rates per the feed done. The min order per unsexed is 8 per breed.. I am thinking of ordering in either 10 or 14 of each breed, that is still a touch up in the air yet. I will be raising between 20 to 28 turkeys in 2019. I am hoping that my single remaining turkey hen will take on some of the mothering duties, she is a very good momma and I have no doubt that she will lay and sit and will be very surprised when a clutch arrives under her in the near dark. I will be raising them in two grow out pens, the larger ones will go to the momma hen and then mini classics will go into their own with heat lamp. I think that because they grow so fast, that they need to be split out size wise, I will see if I am right on this or if I change it at a later point. Have you raised the mini-classic’s? Are you raising turkey’s this year? What is your favorite heritage turkey breed? and can you easily get access to them in your local area? This entry was posted in turkeys and tagged Meat Turkeys, Raising Turkeys, Turkey Pullets, turkeys. Bookmark the permalink. We used to do many many turkeys….both large white and a heritage breed “Bronze”. 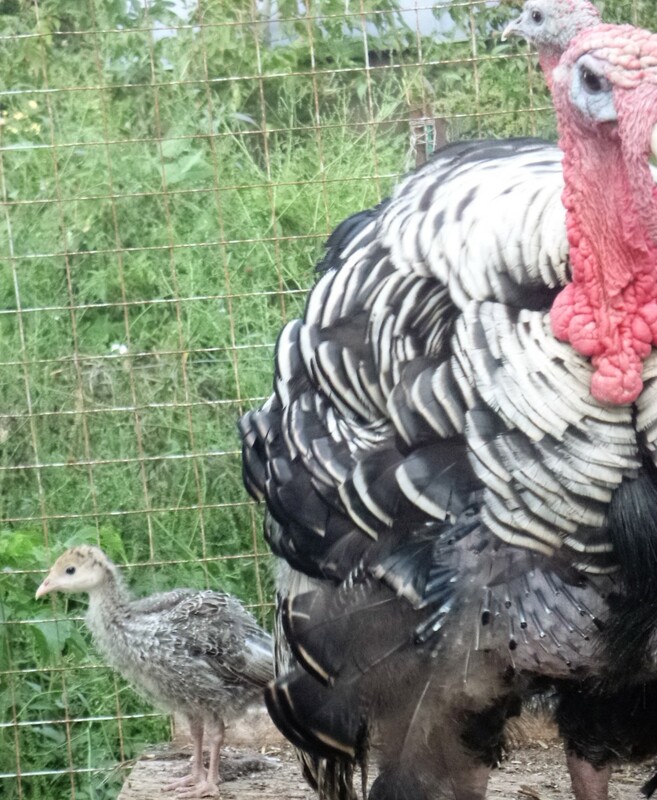 I’m not a fan of raising turkeys really…..good idea on your part to split them up – we did after finding the larger breed picked on the smaller breed. I also used to start them out with broilers so they could ‘get it’ for where the water was and food. Because the large traditional white breed grows soooo fast – sometimes we would have a few with leg trouble etc…..pop those ones out separate right away – any turkey that was ‘different’ (injured etc) promptly got victimized. They say that the white turkeys can breed…..but we found they simply got too heavy to do the job. For size I liked the Bronze best – but you had to wait til hard frost to butcher – so the ‘ink’ in the feathers stayed in the feathers so to speak. Otherwise the turkey looked like it had a thousand black freckles. Tasty – just not ‘consumer appealing’. Yes for sure, while its been many years since I raised my last large breasted white, I remember that they get massive, no way they are breeding as they age out well. I know that the hatchery’s do AI, which is just crazy but whatever. I agree, they are not nice to anyone that is hurt.. most fowl are not.. I find Geese are the nicest.. where the other birds are just bad that way.. Anything “off” and you become prey to the flock.. I agree.. splitting the sizes is just a good idea. The hatchery we deal with used to sell ‘turkey saddles’ 😂 for just such an occasion. In theory you wrestled the hen into the thing and the Tom would have something to hang onto…..
LOL.. o my gosh.. snorting out loud on that one..